“We’ll look at five works for ten minutes each,” I said after my group assembled in the Koret Visitor Education Center for SFMOMA’s version of Slow Art Day. “Please don’t read the placards. I prefer you not take notes. The works’ identity won’t be revealed until the follow-up discussion here in the center.” I was excited about the possibility of exploring the wonders of less distracted, even decontextualized visual thinking. First up was a 2004 photograph from Paul Graham’s Pittsburgh portion of his 2007 book A Shimmer of Possibility. “Feel free to get close to the image,” I said, observing the members of my group surrendering their attention. Slow looking is an exercise in trust, I realized. 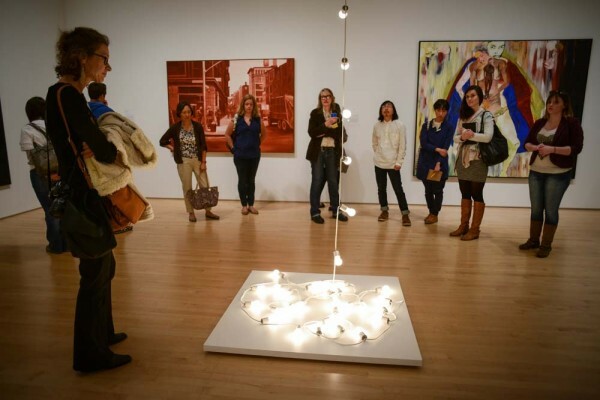 Next was Felix Gonzalez-Torres’s 1992 “Untitled” (America #1), a floor-to-ceiling cord of 15-watt light bulbs. Installed differently each time it is shown, it’s a slow burn, with a fragile, nearly painful brilliance that forces active looking—staring at “Untitled” (America #1) physically hurts the eye. Our bodies mimicked our sight as we circled the work, which was placed in the center of the room. Other visitors happily joined us. While guiding my participants toward the fourth selection I noticed a collective sigh of Oh no, not that one. When briefly glimpsed, Glenn Ligon’s White #13 (1994) seems impenetrable, but a patient roam of its surface reveals letters and flickers of white struggling through luscious black paint stick. “I kept seeing the word God,” a member of my group later said. “Godfather,” echoed another. Someone else added, “I read A Brief Vacation.” Ligon lifted the text from “White,” an essay on race in the cinema by theorist Richard Dyer. A pale, humongous, naked lady glowed within our last work, Jenny Saville’s 1999 canvas Hem. Squeezed into the top frame, the lady’s head wore what our group found to be a mysterious expression. Up close and personal, Hem’s delectable, fleshy surface evokes frosting, peach ice cream, prosciutto, and milk chocolate. Paint? It’s food. And on one of the longest walks we took from Combray, there was a spot where the narrow road emerged suddenly on an immense plateau closed at the horizon by jagged forests above which rose only the delicate tip of the steeple of Saint-Hilaire, but so thin, so pink, that it seemed merely scratched on the sky by a fingernail which wanted to give this landscape, this exclusively natural picture, that little mark of art, that indication of human presence. Not only is the structure of this winding sentence representative of the entirety of Proust’s circuitous narrative, its subject—the steeple of Saint-Hilaire—is metonymic, like Ligon’s word fragments and Saville’s foodie brushstrokes. The steeple stands in for and distinguishes the town of Combray. Fragments of psychedelic light are the distinguishing, uncanny details of Graham’s photograph. They are revealed by allowing one’s eye to wander through the photographic landscape with the same rhapsody as with any staggering work of art in any medium. Emily Jain Wilson grew up in the Bay Area and received a BA in English and an MFA in painting from the University of California at Berkeley. She has been an affiliate at the Headlands Center for the Arts and recently showed her work at the Patricia Sweetow Gallery.